Blogging is now a post Sunday thing for me and subsequently, baking has also become a Sunday must-do in the Hassan household. We all like to get together,and this one was definitely a team effort. My favourite part of the team baking had to be when making the icing for the rolls. Best friend Shannon was whisking away when best mum Zehra said "that look's like something I've seen before' - I put it down to menopausal hormones. Drizzling it over the bun with a fork afterwards was literally the icing on the metaphorical bun. More appropriately, I always dreaded the thought of baking buns or rolls or bread type balls, in my head I mentally put it in the same category as puff pastry - a place no amateur should go! But these were simple.Time consuming-ly simple! My favourite part in the baking was gently shoving my hand into the warm proved dough - a fetish I and probably loads of you out there can proudly admit! I had two go's at the bun making, as the recipe makes approximately a life time supply of buns, I made one batch yesterday afternoon and one today. Texture wise, the refrigerated dough was more dough-y. Now onto taste (this deserves its own little paragraph), completely and utterly irresistibly deliciously unbelievably the best homemade cinnamon roll I have EVER tasted. Don't let the fact that this was my first homemade C.Roll put you off, either. I've still tried tons of them, and I will gladly give anyone £500 who doesn't agree with me. Any genuine takers? WARNING: makes A LOT of rolls! Start by preparing yourself for the mind blowing taste experience that's about to happen and then get a deep saucepan and fill it with milk, oil and sugar. Heat the saucepan on medium, until the mixture has just reached boiling point and then remove off heat and set aside until it is luke-warm. Sprinkle all of the yeast on top of the lukewarm mixture and leave to do its thing for just 1 minute. After that, plop in 8 cups of the flour, the bicarb, baking P and salt and mix till well incorporated. Cover with a clean paper towel and leave to prove for at least 1 hour. The dough will keep for a couple of days. Once the dough has proved, take half of it and place on a clean surface. With flour at hand, begin to roll into a large, thin rectangular shape. Now is also the right time to preheat the oven to 204 degrees C.
Take your melted butter and smooth all over the rolled dough till there are no surfaces left to cover. Now sprinkle a cup of the sugar all over the butter (the extra cup is for the other half of the dough). Now sprinkle sprinkle sprinkle on that cinnamon until it looks like a brown carpet. Take the long end of the dough and start to tightly roll the dough towards or away from you, roll gently until you have something that looks like an off white snake. Take a sharp knife and cut each roll one inch thick. Place in greased foil trays or a large greased tin and squidge the rolls closely together. Bake for 16/17 minutes. 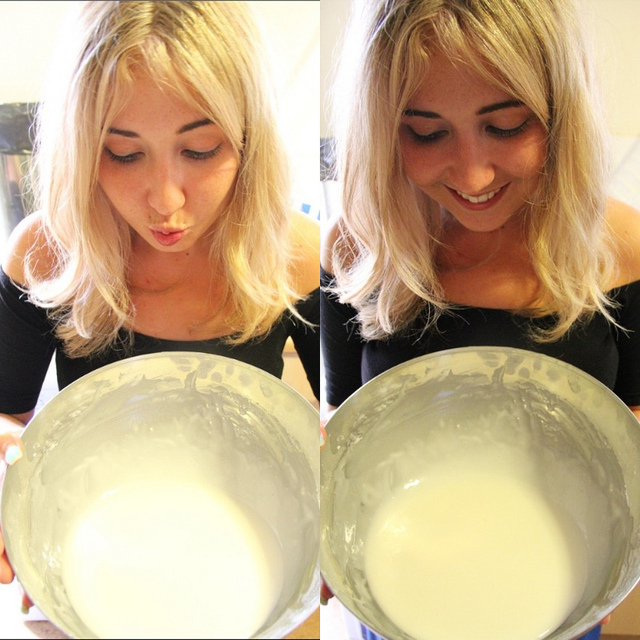 Whilst baking, prepare the icing by whisking milk into the icing sugar until you reach a desired consistency, 2 tablespoons usually does the trick. 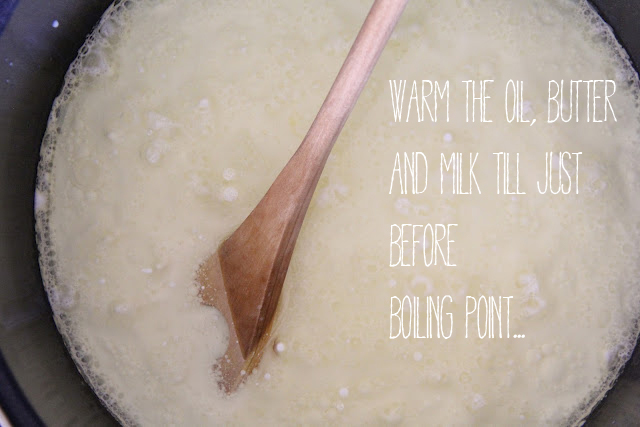 Take the rolls out of the oven and drizzle on the icing with the end of your whisk whilst the rolls are still warm. Take a look at the photo methods below for extra inspiration! So there you have it, one last thing - do people like the methodical photographs? They might be a permanent thing! this is a wonderful cake. Love your tutorial and photography! @Naomi - cinnamon and sugar together is just....i dont even know. Thanks for ze comment ! Oh my god I love the look of these! I've always fancied trying my hand at cinnamon rolls. Love your step by step pictures too. I don't know how folk manage to to do them, I just know I would end up destroying my camera, probably getting flour and grease getting stuck in the lens. I was away to make these and I notice you have not said when to add in the yeast, is it at the same time as the flour? Sorry I meant add the yeast, let it sit on the lukewarm mixture for a minute before adding the flour! Thanks Emine. We had added it with the flour, oops! However they turned out delicious. We used half the dough to make the recipe as you did it and the other half to make a version of Monkey bread, both were delicious. Sorry for the confusion! As long as the yeast was added and proved for long enough it doesn't matter. I'm glad you enjoyed th recipe! Would be great to see some pictures of the two !